Having had a Race School cancelled the previous day due to the bad weather, our sacrificial virgin proved her worth and we had great weather on Sunday until 4:50pm, when the drizzle began as a precursor to a downpour. The first car on track was Ryan Weir in his well-finished BMW 320. Justin Duff was back for two in a row in his BMW and we welcomed Nicholas Wood back in his “Princess”, a Honda engine Lotus Elise. These cars motored quickly and trouble-free all day. 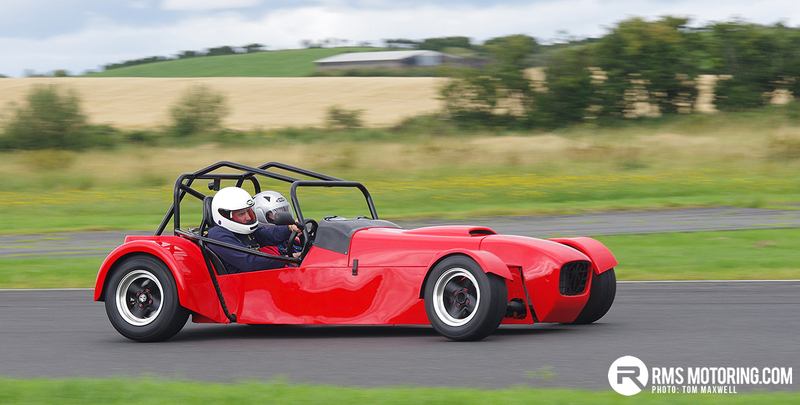 Damien Moran had a nice V5 Golf, in place of his trusty Elise, this time. It went well until late in the day, when gremlins struck. Derek Le Mahieu didn’t seem to have been slowed by his recent Canadian holiday and his black Focus went well all day. John Cosgrove will have to endure the wrath of his brother Michael for breaking their trusty Toyota MR2 in his absence. An excess of brakes seemed to be the problem! Highlight of the day for me was the great tussle that Terry O’Neill in his Maserati 4200 had with Jonathan Garrett in his Audi RS4. While they were always a respectable distance apart, the combined sound was wonderful! John Bates lapped quickly and safely in his VW Bora as did Conor Doherty in his Clio. Other Clio’s included Mark Mooney, who always goes very well, Brendan Cumiskey, who seemed to have a trouble free run at last, Alan Forde who ran trouble-free and fast all day and Leslie Graham who had an engine issue after his second run. David Hill was there for the first time in his mint Fiesta ST with a very snazzy paint job. The sun (yes, it was shining!) reflected wonderfully on the metal flake. He and his companion both drove well but elected to quit shortly after lunch, having had a good time. We had an influx of Murray Motorsport cars for the first time. All were well turned out and mostly ran quickly without problems. 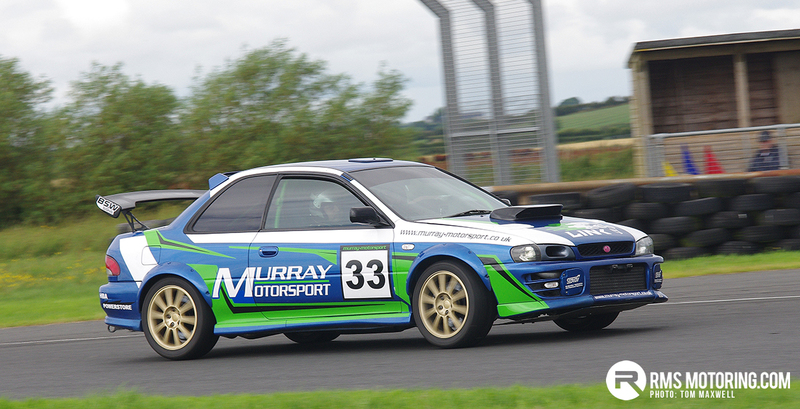 I think the only issue was a boost pipe, or suchlike, coming loose on Davey Murray’s Impreza. Paul and Ryan were also running Impreza’s while Seamus was running a Honda Civic and Declan was running an Astra GSi. Arnold Gibson was flying, as usual, in his Yellow BMW and he and Stephen Potter (Integra) were never far apart. Lyle Simpson had a Nissan 300ZX, which seemed to be a bit of a handful in the corners. A dodgy rear shock absorber was suspected. Colm O’Duil and David Cousins were upholding the reputation of the Mazda MX5. The #22 East Engineering car had a fuel pressure problem, early in the day but David sorted that and it ran well to the end. Colm’s car never missed a beat. Dean Kennedy’s Civic is a really quick machine and he made best use of it all day. Jonathan Christie had forsaken his trusty Prelude for the joys of a Civic and it took a serious constant pounding. 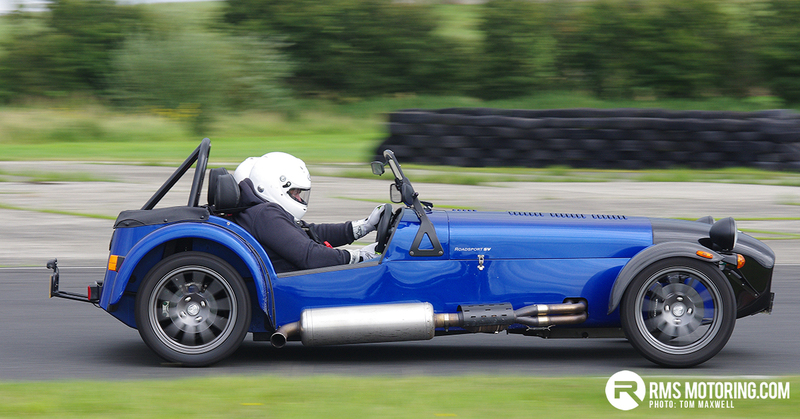 The Locaterfield brigade were represented by Stephen Dawson in his Caterham and Andrew Parkinson in his MK Indy. Stephen had just decided to call it a day and head home, when the heavens opened! Half an hour earlier and he would have been home and dry! Unfortunately, Andrew’s car had an expensive blow-up towards the end of the day. As ever, the marshals did a great job all day, as did Philip Brooks who provided medical cover and generally did anything else that needed doing. Thanks to all of them. Our next date is after a five week gap on Sunday 25th September. Hop | Well, had the Clio out today. Either clutch or gearbox away on 2nd outing. Great day out though as usual but probably October before I'll be out again as young lad starting autograss! Great turnout and some quick motors on show. Anyone know anything about the silver 5 door saxo? Busy day last sunday , the most cars I've seen at a trackday ! lots of fine machinery there all going quickly , nice to see so many bmw's , though I think @StephenDc2 in the manic Honda the fastest outfit there . The rains came at 4.30ish and just before that the Rs4 and the Maserati were on track together ,the noise they were making obviously corrupted Donals virgins and caused the heavens to open !!!:oops:. Had only slicks with me so had to call it a day , but enjoyed the tracktime I got , As ever thanks to Donal and crew for a well managed event . | Anyone know anything about the silver 5 door saxo?